Beaumaris is unique amongst the castles constructed for Edward the First by James Saint George. Although it was never finished to its original design, the intent is clear and thus presents a great opportunity to construct this castle according to the original plan, beyond what stands today. The wallwalks were never completed, no form of merlon was ever added to the walls of the inner ward. Also, work on the south gatehouse was abandoned, marring the beautiful symmetry of this perfection of castle design. Other elements, such as the Llanfaes and the sea defences would benefit greatly from computer reconstruction. After an extensive (albeit wet!) reconnaissance trip to Beaumaris - during which more than 2,000 photographs were taken of the site - preliminary reconstruction has included laying out the shape of the inner and outer wards and initial work on the ground floor of the towers. 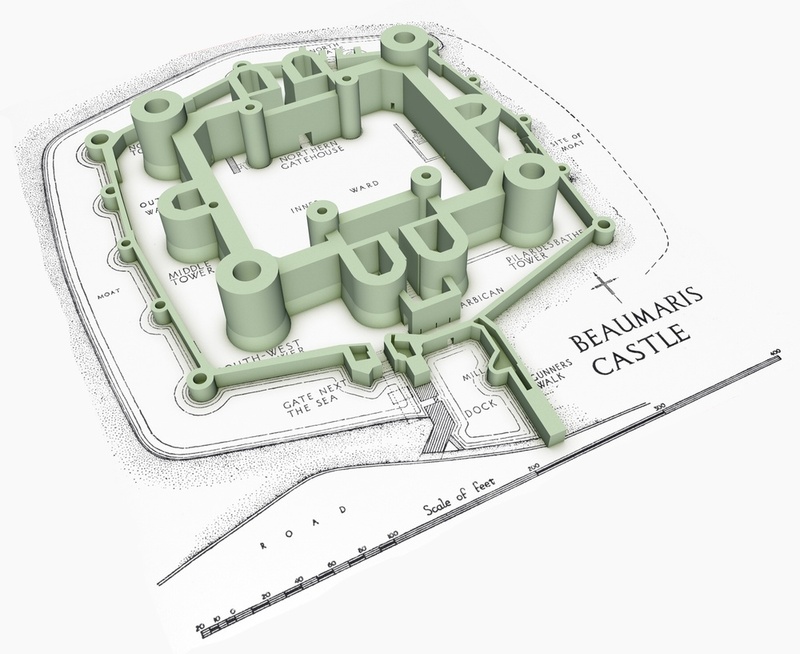 Find out about the History of Beaumaris Castle in our Castle Finder blog.